The ACID smoking experience is like no other. Each blend holds new explorations in tobacco curing and blending that are the closest guarded secrets in the industry. Earn up to 138 Points Points. 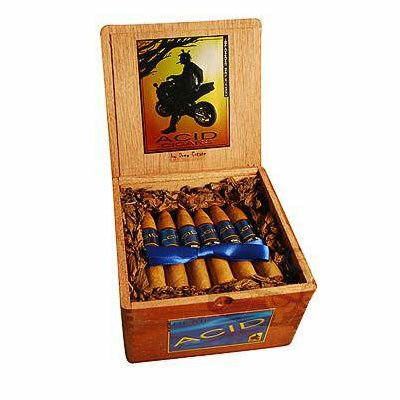 ACID Cigars are #1 with a bullet when we’re talking about the best infused cigars on the market. That’s not even a question. And there’s one line within the ACID brand that reigns supreme over them all — Blondie. For the past 10 years, legions of you have sought out ACID cigars in the far corners of the world to satisfy your craving for something truly one-of-a-kind, unique and inspiring. Explore the entire range of kaleidoscope tastes never before imagined in a cigar and be rewarded for your efforts. Acid Blondie Belicoso: delicious flavor in a larger size.